It’s a scenario that arguably every driver in the world has experienced at some point in their lives. We approach an intersection and the traffic signal is green, giving us the right of way. As we are about to proceed, a vehicle approaching the intersection from the left or right skips the red light. Sometimes we see the danger and manage to stop, avoiding a collision – sometimes we don’t. Many thousands of people have been seriously hurt or killed in this way. Our chances of avoiding a collision with a rogue vehicle depends on how much attention we were paying and whether we could see the danger in time. When buildings and other infrastructure obstruct our view, it reduces the amount of reaction time we have, sometimes to the point where a collision is almost unavoidable, especially when excessive speed is involved. Australian multinational Cohda Wireless believes that this is where its connected autonomous vehicle technology can save lives. Cohda recently demonstrated its world-leading technology in a live trial on the streets of the city of Adelaide, where it is headquartered. The trial proved the potential for connected self-driven vehicles to make our streets much safer than they are and that Cohda’s technology is effective even in the most challenging of environments - the so-called ‘urban canyons’ of a typical city. In an area covering two city blocks just east of Adelaide’s iconic Victoria Square, the demonstration replicated the scenario described above. Two vehicles approach a four-way intersection at right angles to each other. Car 2, driven by a human, fails to adhere to the red-light signal and approaches the intersection at speed, intending to ‘skip’ the red light. Car 1, a connected autonomous vehicle, is approaching the intersection from another direction and intends to proceed through the intersection on the green light. In a real-life scenario, there would be a risk of a collision, as human drivers will invariably approach the intersection when the light is green, fully confident that all other road users will obey the traffic signals. In an instance where Car 2 disobeyed the traffic signal and Car 1 was unable to see the approaching danger, due to visibility being obstructed by buildings or other infrastructure, a collision would be especially likely. But as Cohda Wireless’s Chief Technical Officer Professor Paul Alexander explains, if the vehicles were connected using Cohda’s V2X (Vehicle-To-Everything) technology, a potential collision situation would be detected and avoided well in advance of it actually happening. In June 2018, Cohda Wireless took ownership of two specially modified vehicles from the USA that it is using in advanced trials of its world-leading V2X (Vehicle-To-Everything) technology. The two Lincoln MKZ sedans were fitted with the ADAS (Advanced Driver Assistance Systems), ROS (Robot Operating System), various sensors including Lidar, Radar, cameras, GPS, plus an in-vehicle compute platform and Cohda’s GNSS-independent positioning technology. The fusion and cooperation of the various sensors and Cohda’s V2X technology augment the vehicles’ perception capability and make the autonomous vehicles features more practical, to include threat detection, the dangers associated with blind intersections and vulnerable road users. “Our goal with the demonstration was not only to demonstrate the efficacy of our technology in enabling self-driven vehicles to communicate with each other but also to do so in a city environment where so-called ‘urban canyons’ significantly affect the ability of systems reliant on Global Navigation Satellite Systems (GNSS) to achieve accurate positioning,” added Prof Alexander. The most important piece of information any autonomous system must know is its position in the world. The more accurately a vehicle knows its position, the more it will be able to understand itself and its surroundings. Accurate vehicle positioning is vital for safe and reliable operation of Connected Autonomous Vehicles (CAV) and Vehicle-to-X (V2X) applications in all operational scenarios. These requirements are quantified in several standards globally. For example, SAE specifies a 1.5m requirement must be met 68 percent of the time. However, in many important use cases Global Navigation Satellite Systems (GNSS), even assisted by dead-reckoning sensors and atmospheric corrections, fail to provide a reliable position. Typically GNSS positioning performance degrades in areas such as urban canyons, tunnels, parking garages and anywhere where there is a compromised sky view. Dead reckoning relies on inertial sensors that drift with time and cannot be used for absolute positioning. 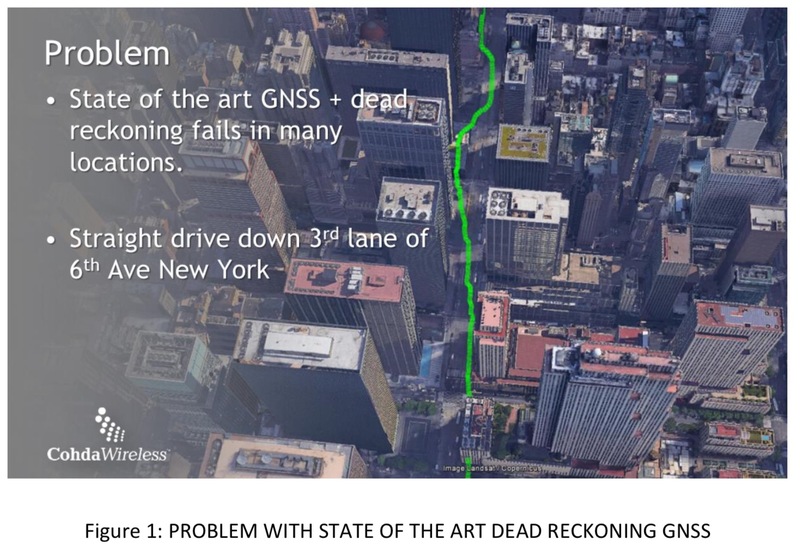 Exemplifying this statement, a state-of-the art automotive grade dead reckoned GNSS positioning system, driven in a straight line, within the urban canyon environment of New York City is shown in Figure 1. Such failures result in unpredictability and indeterminism of vehicle position, leading to potentially erroneous decision making and unsafe manoeuvres, effectively compromising the safe operation of CAVs. In V2X, vehicles communicate with other devices (vehicles, infrastructure, pedestrians, etc.) using wireless communication systems such as Dedicated Short Range Communication (DSRC) or IEEE 1609 or ETSI ITS. Both standards use IEEE 802.11p as the underlying physical and medium access layer technology. In V2X deployments, vehicles are equipped with On-Board Units (OBU), while infrastructure is supported by installation of Road Side Units (RSU). RSUs are typically deployed by road authorities or third parties (like parking garage operators, petrol stations etc.) at fixed locations, primarily to provide back-haul and/or locally managed services. In addition, these RSUs generally broadcast their position information in either Wave Service Announcements (WSA) (IEEE 1609) or Geonetworking messages (ETSI ITS). Thus, the location of these RSUs is well known to any vehicle that is within communication range. V2X-Locate uses ranging measurements to these fixed RSUs to enable enhanced positioning accuracy as demonstrated in Figure 2 (right). The vehicle is shown as a blue triangle and the ranges to RSUs are illustrated as intersecting green circles. Each circle is centred on an individual RSU’s known location with radius equal to the range measurement. These ranges from spatially separated RSUs are fed into Cohda’s enhanced positioning engine to accurately position the vehicle. This positioning engine provides information at the facilities layer of the software stack of the OBU. The performance of V2X-Locate compared against a state-of-the-art automotive grade GNSS module in an ideal open sky condition is shown in Figure 4 below. For this comparison, the two solutions were installed in a vehicle that was driven in a rectangular path along predefined reference lines in an open car park. The DSRC and GNSS antennas were co-located within the vehicle’s sharkfin antenna (less than 2cm spacing between them). The Cumulative Density Function (CDF) shows the lateral error, as compared to the predefined reference lines, of both the GNSS and V2X-Locate solutions over 5 repetitions of the trial. In perfect GNSS conditions V2X-Locate can match and even surpass GNSS performance. After all, there is no need to track satellites that are 12,000 Miles away travelling at 9,000 Miles/Hr, rather the RSUs are a few hundred metres away, stationary and at fixed locations. 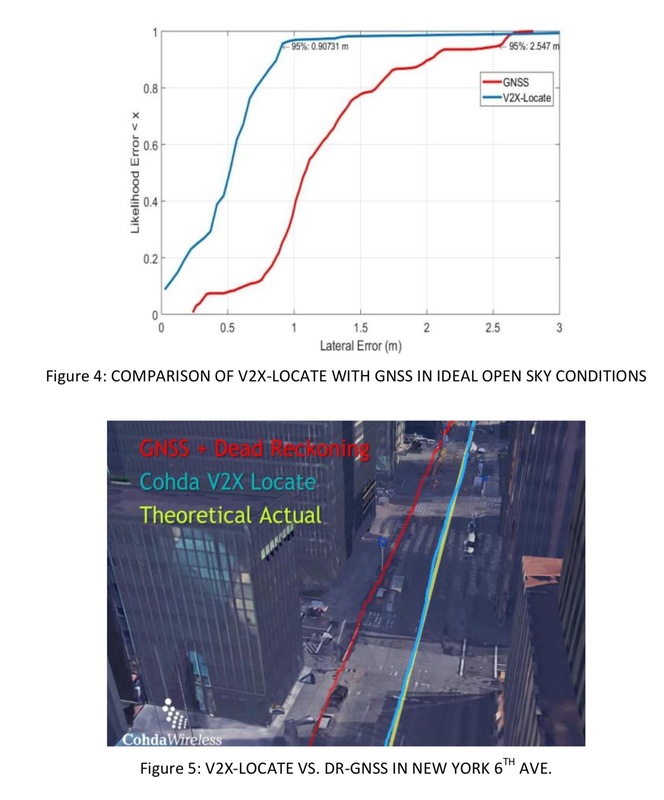 Figure 4 demonstrates how GNSS (with Dead reckoning and WAAS) and V2X Locate operating effectively in idealised “Open Sky View” conditions such specified in SAE J2945/1 . Both meet the SAE performance requirements. V2X Locate was better than 91cm 95 percent of the time, whereas GNSS was better than 2.5m 95 percent of the time. The utility of V2X-Locate is particularly evident in GNSS challenged locations. Urban areas experience the majority of traffic congestion, and are also prone to poor GNSS performance due to “Urban Canyons” caused by large buildings. Indeed these locations are precisely where V2X RSUs will be deployed by cities and road authorities. New York, USA is one location that experiences both of these problems. To demonstrate the utility of the V2X-Locate solution in such environments, V2X RSU infrastructure was installed along a test section of 6th Avenue, New York and a vehicle equipped with both V2X-Locate and GNSS solutions driven in a straight line down the third lane. As expected, GNSS performance is significantly challenged within this exemplary environment as shown in Figure 5 above. In contrast, Cohda’s V2X-Locate positioning system is able to achieve sub-metre accuracy. The V2X-Locate solution is not intended to replace GNSS solutions, but instead compliments and integrates this technology. Thereby creating a solution that not only operates in ideal GNSS environments, but also GNSS challenged environments to enable an integrated platform capable of operating in all V2X and CAV operational scenarios.